back to the house where we were staying and cooked supper. around 9PM. We fished until about 3 AM. 1 or 2 on a Gottcha plug back to the pier. were caught on the right side also. We fished for a while and then I went back to the truck to get the overflow cooler. 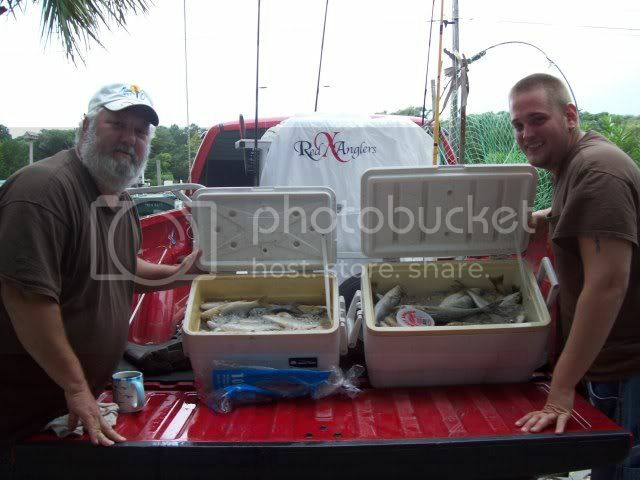 We ended up with 150 spots, 5 blues, 1 grey trout, 2 sea mullet and 1 croaker. We were going to fish Saturday. I am sure glad it blowed up a storm and stayed all day. Don't know if I could have stood to dress out another 100 or so spots.